The need for forgiveness is one of the deepest needs of the human heart. Forgiveness is a result of God's miraculous grace. 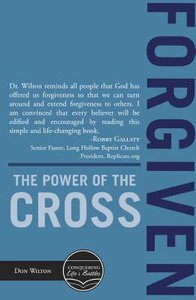 Forgiven by Don Wilton leads you straight to the Cross of Jesus where you can be absolutely certain that you are forgiven of your sins. But it doesn't stop there. A right relationship with God sets the stage for a right relationship with every other person in your life. Hurts run deep and it is difficult to forgive those who have wounded you. Many Christians live their lives needlessly handcuffed and chained to the past. In doing so, they pass down a heritage of bitterness and hatred to their children. Forgiven will lead you to choose forgiveness over bitterness. It may seem inconceivable to you at this point, but God wants to use your story of forgiveness for His glory! Are you ready for the power of the Cross to change your life for eternity? About "Forgiven: The Power of the Cross"